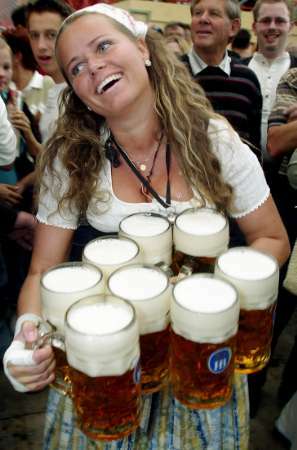 A waitress carries one liter beer mugs during the opening day of Oktoberfest, in Munich. The 171st Oktoberfest lasts from 18 September until 3 October. Some six million beer drinkers from around the globe are expected to visit the Bavarian capital for the world's biggest and most famous beer festival.